The IMC recently upgraded some of our student study rooms to include RamCast systems. The split room of 103 East and West, as well as the 105 viewing room, have brand new wall mounted TV Monitors. RamCast is a study and collaborative tool allowing you to share the screens of your laptops, phones, or other smart devices. It’s a very useful setup if you have a group project and you don’t want to crowd around a single laptop. Unlike the other RamCast enabled study spaces in the FHG library rooms 103 East and West can be reserved for up to a 2 hour block. For those of you not familiar with this screen-sharing technology, please talk to a staff member at a library help desk. We will be happy to get you set up! 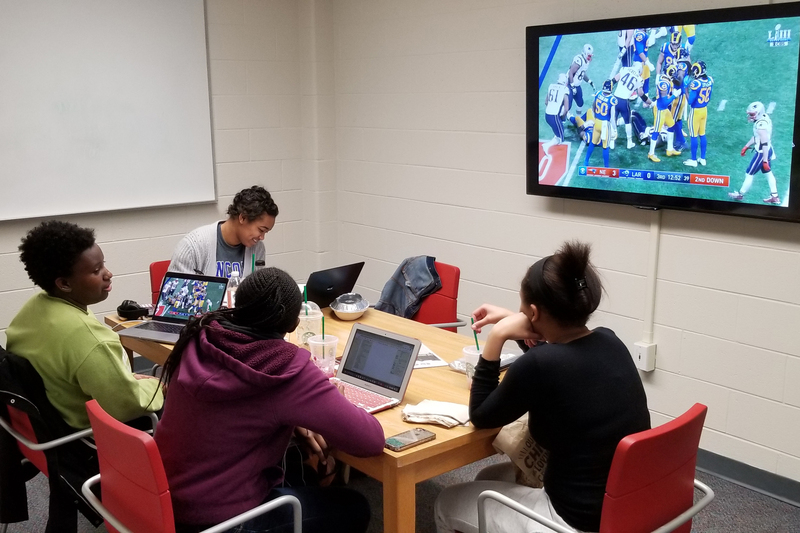 This group of students are using RamCast to enhance their studying experience. We hope you are as excited by these new upgrades as we are! We’d love to hear your thoughts, either stop by the desk or you could let us know by emailing LIBIMC@wcupa.edu . If you are interested in reserving a RamCast enabled study room please stop by the IMC desk or give us a call at 610-436-3395.